The wild roses are blooming in my neck of the woods and they are indeed a beautiful site. I took my harvest basket out for a walk in the woods to harvest some over the weekend. These beautiful flowers have a number of uses both edible and medicinal. 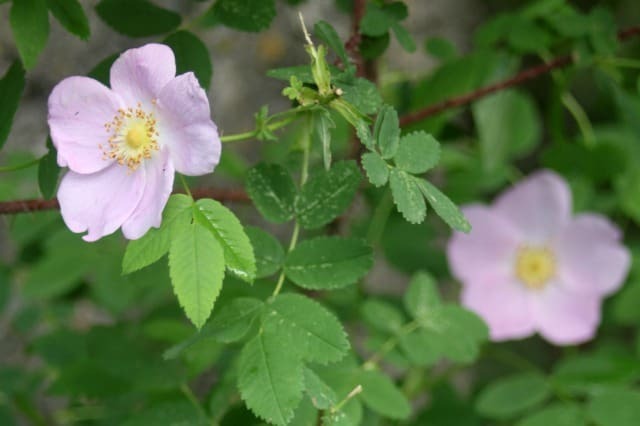 Want to give wild roses a try? Here are 10 ways to use wild rose petals to get started. Rose petals are easy to dry for winter use: simply pull the petals and spread out in a large basket or on dehydrator trays. Let dry until completely dry. Alternatively, put the roses whole on trays and place in an electric dehydrator. Dry, using the lowest temperature possible, until dry and crispy. Pull the petals and store in an airtight jar. Rose water – This is simply a strong tea and quite expensive when purchased. Make your own rose water and store in the refrigerator to flavor baked goods and cocktails. Rose elixir – Mix rose petals with alcohol and honey (or glycerin) for a remedy that can be used internally for a calming effect. Bath teas – Rose petals are soothing to the skin and mind. Use the fresh or dried petals in a bath tea to soak away a tough day. Infuse honey – Soak those petals in some honey for a lightly flavored honey perfect for eating and body products. Skin soother – Purée rose petals with aloe vera gel to soothe burns, bug bites, and more. Jam – Make a beautiful and tasty rose petal jam that is perfect for gift giving. Candied – Coat the petals in egg whites and sugar and let dry for a beautiful, edible decoration. Mead – Ferment those rose petals with honey for a delightful adult beverage. Ice cream – Use rose petals to color and flavor homemade ice cream. Infused oil – Make a rose infused oil for use in homemade body products, lip balms, salves, and more. 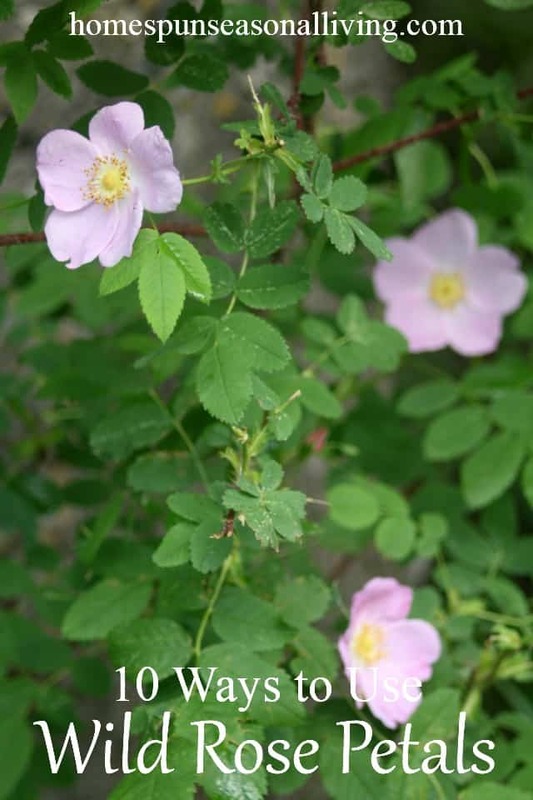 As those wild roses bloom, harvest a jar or two and get creative with food, body products, and medicine. What is your favorite way to use wild roses? I have about a quart of wild rose petal picked yesterday. I never thought of using roses in mead. I may need to do this today. Yum. Thanks for the inspiration. How about really rose growing in your garden. Can we use leave as tea leave for winter time yes or no? please let me know. I enjoyed the article well. Keeping important information. You can use any rose, wild or cultivated. Did you know you can make honey with rose petals, clover blossoms, sugar and water? This is great if you have someone who is allergic to real honey. The darker the rose petals the darker and more intense flavor is imparted to your honey. It is very good. Basically it is just making a homemade syrup but instead using maple flavoring, you add a handful of clover and a handful of rose petals. You can use the wild or cultured rose petal as long as they have not been sprayed. I grow damask roses. Love these ideas on how to use them. Daughter made rose petal jelly it was delicious. She gave it as gifts and people loved it asking for more.